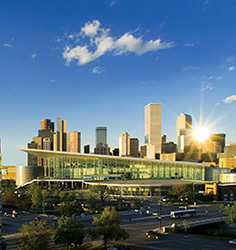 The American Thoracic Society 2015 International Conference is one of the largest gatherings of pulmonary, critical care, and sleep clinicians and researchers in the world. When you take part in ATS 2015, you are among thousands of your colleagues who have gathered to hear the latest and most significant developments in clinical practice; clinical, basic, and translational research; health advocacy; and professional and patient education. A new new Discoveries Series celebrating the ATS’s 110th anniversary by covering seminal clinical and scientific breakthroughs. Adult and Pediatric Core Curriculums that provide opportunities to earn American Board of Internal Medicine Maintenance of Certification (MOC) Medical Knowledge Points and American Board of Pediatrics MOC Part 2 Self-Assessment credits. The breadth and depth of ATS 2015 also is exceedingly apparent in the ATS Exhibit Hall. Among representatives from more than 200 exhibiting organizations, you will immerse yourself in innovations to compare new products and services, participate in live demonstrations, meet with experts, learn about new clinical trials and efforts in the basic sciences, and network with peers. Most importantly, the ATS Exhibit Hall often provides your first look at new technology. NeilMed Pharmaceuticals in Booth 724 will announce the launch of a pediatric line and ear-care products, and Restorative Therapies in Booth 6215 will launch RT300-Supine cycle, a product for critical care. RT300-Supine cycle provides early rehabilitation via leg and arm cycling from a bed. It is ideal for use in the ICU and acute rehabilitation settings. The design fits the cycle over and around the bed, allowing RT300 to be brought to the patient. The height is adjustable via a motorized table. MGC Diagnostics in Booth 334 will announce the release of the Ultima Series CPX and Pulmonary Function system designed to improve patient care by maximizing the technologist/patient interface and improve testing accuracy and workflow. The system has been ergonomically designed to perform exercise tests while standing or pulmonary tests while sitting, with a work area for both. In Booth 651, MIR – Medical International Research will present two new products: Spirobank II Smart and Spirolab. Spirobank II Smart is an iSpirometry and iOximetry app that includes data transfer to a cloud system for backup or second-opinion facility. Spirolab is a portable desktop spirometer with oximetry option and seven-inch touchscreen. It offers a database for up to 10,000 spirometry tests or 900 hours of oximetry recording coupled with search services. Bruker BioSpin in Booth 1150 launched the SkyScan 1278 micro-CT system for in vivo X-ray computed tomography. The technology addresses the needs of preclinical imaging scientists who aim to reduce the radiation dose used in animal studies while maintaining image quality. As part of the development, Bruker has created a new micro-CT spatial beam shaper, which reduces the absorbed dose by up to five times while maintaining quality image output. PneumaCare in Booth 220 will show its Thora-3Di imaging device featuring Structured Light Plethysmography technology. New this year, representatives will share a compact version, which gives the same results and outputs as the Thora-3Di but can be transported as a portable device, which enables its use in more remote areas. In Booth 639, Boston Scientific Corporation will showcase its Ultraflex Tracheobronchial Partially Covered Stent System. In its updated form, the stent has a silicone covering and is provided to customers sterile. Be sure to add these exhibitors your itinerary.